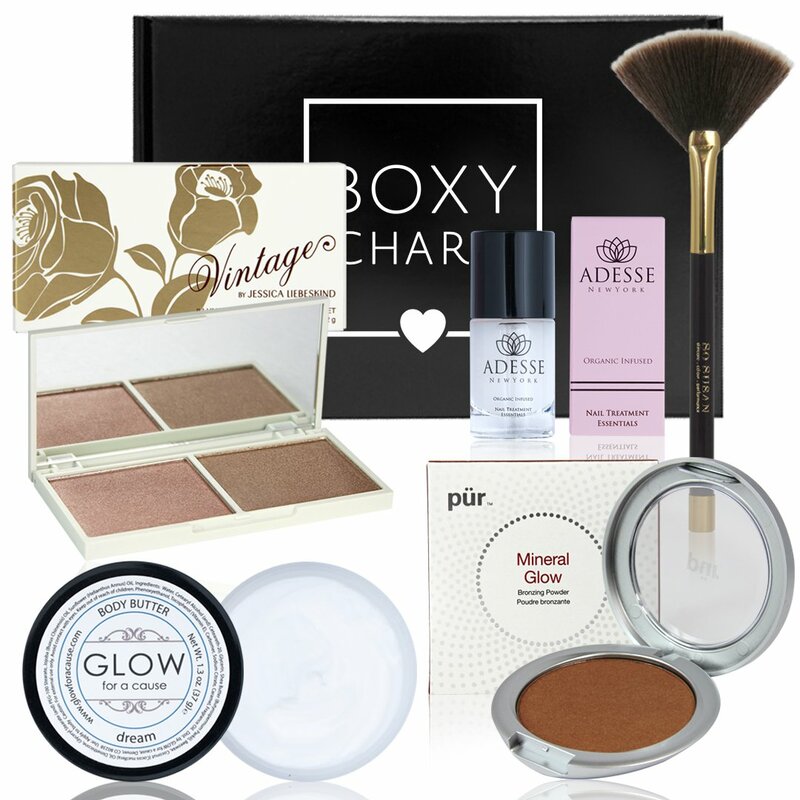 January's BOXYCHARM arrives in time to get our much needed fake glow on. For $21 a month BoxyCharm sends you 5 full size beauty products at a value of over $100 with Free Shipping. Unfortunately the Mineral Glow in my box arrived broken and spilled everywhere! Bummer, but I'm not much of a bronzer girl anyway. Here is what was in my slightly incomplete box! Keep Reading for the BOXYCHARM January Box! Even though I love makeup, I don't really like wearing it on my skin. The way I like to cheat makeup is by focusing on keeping my complexion clear so that I don't have to wear as much foundation. Of course that isn't always something we get to choose! I have a daily skincare regimen, but even the strictest of skincare routines can't prevent those stress and hormonal breakouts that we all get. My skin is sensitive and acne products are often too harsh for me to use. 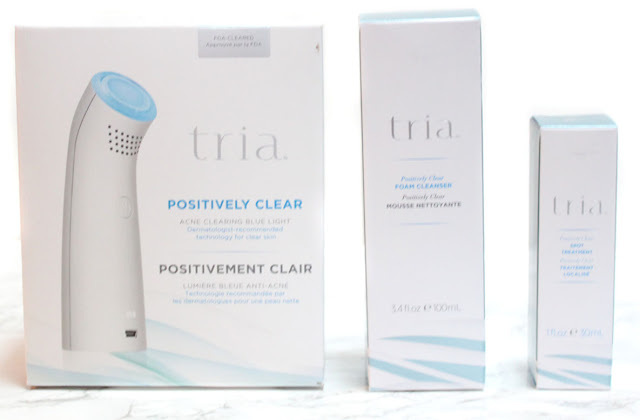 The new TRIA Positively Clear 3-Step Acne Skincare Solution aims to give you clear, healthy skin without the harsh side effects often associated with existing acne treatments on the market. Sounds promising! The Positively Clear 3-Step Acne Skincare Solution is the ultimate combination of the most powerful and #1 selling FDA-cleared acne-fighting blue light and dermatologist-tested skincare to clear acne fast in the comfort of one’s home. This revolutionary combination treats acne more effectively than traditional acne treatments alone by gently eliminating bacteria at the source, deep within the skin, without harshness. With a treatment time of only five minutes per day, the device is easy to use and easy to incorporate into your existing skin care routine. Clear, healthy skin is just 3 steps away with the new Positively Clear 3-Step Acne Skincare Solution. It’s the one and only dermatologist recommended acne-blasting treatment that combines bacteria-fighting blue light therapy with potent skincare to treat more effectively than traditional treatments alone. This easy 3-step fix addresses all 4 causes of acne to reveal glowing, flawless-looking skin. Cleanse. Treat. Target. And say good-bye to acne. Step 1: Cleanse Cleanse your skin with Positively Clear Foam Cleanser to mop up oil, dirt, makeup and other impurities that may block the blue light. Step 2: Treat Here comes the fun part: Glide the Positively Clear Acne Clearing Blue Light over the area you want to treat for just 5 minutes daily. Show love to your entire face or just concentrate on breakout-prone zones. Step 3: Target Hit those troublesome areas with Positively Clear Spot Treatment, expertly formulated to complement the use of the blue light and improve overall radiance. In the meantime, be sure to check out Reviews.com research on the 42 most popular acne treatments on the market. Here's to starting off 2017 feeling more confident in your skin!